Laser-cut invitations up your wedding design game. Sarah Glad, owner of A Milestone Paper Co., created this Art Deco stunner for one daring couple. 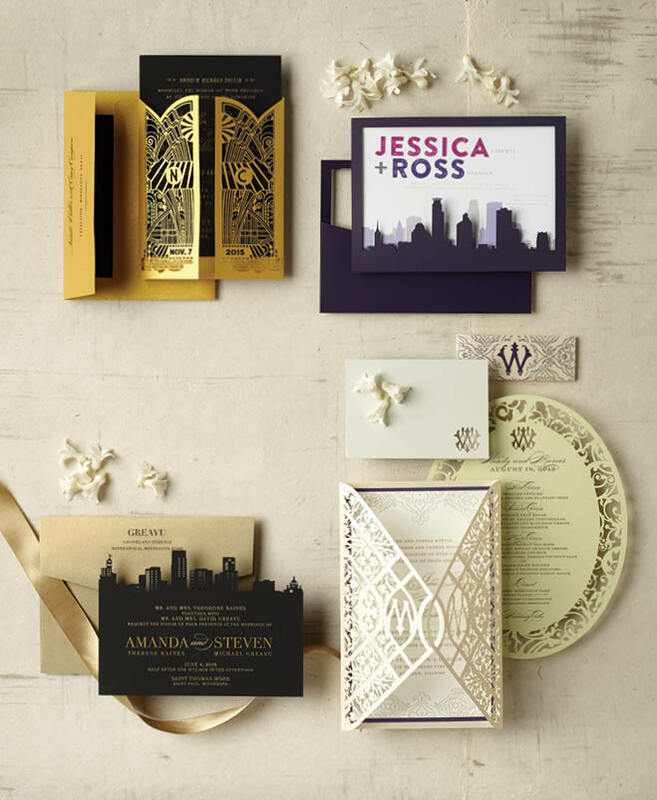 “They wanted a luxurious, unique invitation to set the tone for their wedding,” Glad explains. When they hit on the idea of a grand gate opening to an estate, she knew laser-cutting could play a starring role. “The laser-cut wrap was the dramatic focal point, with its intricate details and personal touches like their initials and wedding date,” says Glad. Thick black stock with gold foil lettering shows off the ornate latticework and adds elegance. My Choi, owner of PaperThick Ink, was delighted when this couple asked for an invitation to show off their beloved Minneapolis—because she loves it too. She began by creating a drawing of the iconic skyline, then produced all the pieces locally. The pocket is laser-cut from a dark purple suede-textured paper, says Choi. She created dimension in her design by layering multiple laser-cut silhouettes in different shades of lavender and gray to create shadow and gradation. Modern typography and a pop of vivid fuchsia pull it all together for a look Choi calls urban, chic and fun. “The amount of detail we can include with laser cutting is so exciting,” says Sarah Glad, owner of A Milestone Paper Co. For this invitation featuring the St. Paul skyline, those details are everything. “In this suite, we even included the iconic neon ‘1st’ sign on top of the First National Bank Building,” adds Glad. Thick black cardstock and gold foil give the invitation a champagne-at-midnight vibe. For an extra sense of occasion, the invitation arrived nestled in a pocket card and tied with a satin bow. “Many of our couples want to incorporate their initials or a monogram as a way to personalize the invitation suite,” says Valerie Carlson, owner of Spark Letterpress. “Because laser-cutting allows you to layer the design, we were able to use that on the invitation wrap to make their joined initials a lovely mark to be used throughout their printed pieces.” Letterpress and laser-cutting provide a variety of textures to keep the monochromatic feeling rich and elegant. A range of whites from pearl to ecru also lends interest, especially coupled with plum accents.